Update – This is now Discontinued: Check out the new Lay-Z-Spa Dome Enclosure & Gazebo here. If you have an inflatable hot tub, or even a more tradition spa then how about giving it a cover allowing you to use it whatever the weather, rain or shine. 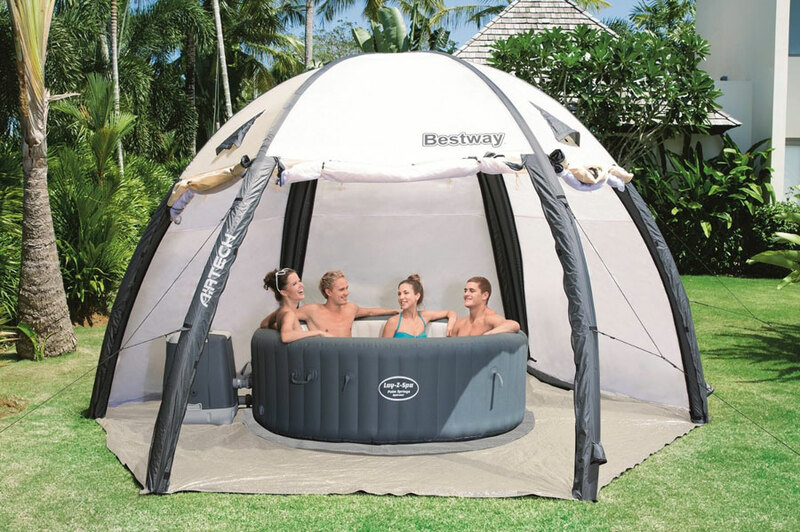 The Bestway LAY-Z-Spa Gazebo Accessory is an inflatable tent designed to cover your inflatable hot tub. With six sides and six inflatable poles the gazebo creates a dome over your spa protecting you from wind and rain when enjoying your jacuzzi. The dome is well ventilated and can offer protection from the elements, as well as creating shade from the sun, and providing privacy. With this you get the dome itself which comes with 24 pegs to ensure it is fixed well to the ground, a pump to inflate the dome and a carry bag for it all. There are two-layer door/sides: The outer layer is made of 190T polyester, the inner of anti-insect net. Both can be rolled up or down as you choose. The total height of the dome is 2.5 metres with a depth and width of 4.2m. 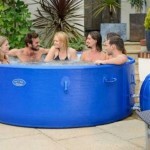 With this size it can accommodate a spa or pool with the max width of 3.8m. 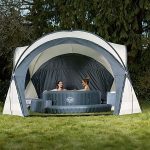 Priced at nearly £300 this is not cheap, however the dome is huge and is great for providing protection for the spa and also creating a little hideaway with privacy in the garden for your hot tub. 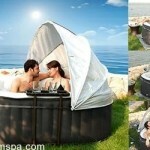 Update: Check out the new Lay-Z-Spa Dome Enclosure & Gazebo here. My spa has a hole….how do I mend it? Where do I get the patches from??? I’m on the 3rd dome, materials are very thin and will tear if in sunlight.